Is Your Child Highly Sensitive? by Elaine N. Aron, Ph.D.
Second, before I began studying HSPs, my husband (a social psychologist) and I were very engaged in psychological research on love and close relationships–and we still are. Indeed, in that field we are considered preeminent leaders, although neither of us has ever written on the topic for the public. This book will teach you quite a bit about what’s been uncovered by solid research about relationships. Plus, it unveils my most recent results on HSPs and relationships. You won’t find that blend or those new results anywhere else. Third, for over thirty years I’ve been an HSP married to a non-HSP–some of it pretty stormy–so I have considerable experience with how temperament impacts a relationship! Most of us assume that the success of a relationship between friends or lovers depends on having good communication skills or sharing similar interests. But consider this: A 1995 study found that 50 percent of the risk of divorce is genetically determined. Does this mean success and fulfillment in social life are inherited? What can we do about that? The single largest reason for this genetic effect is not a “divorce gene,” I’m certain. (To say something is genetically determined doesn’t clarify much–wearing skirts or owning a rifle is almost totally “genetically determined,” thanks to the genes for gender plus a lot of cultural moderators.) Genetics enter into marriage because of the way that certain inherited temperaments cause trouble in relationships. They cause trouble only because most of us are totally ignorant about the reality of the drastic differences that can exist among nervous systems. But with the right guidance, the many “mismatches” in this world can have the most fulfilling relationships of all. Let’s start with the temperament we know, sensitivity. About 20% of us are highly sensitive persons (HSPs); at least 34% of love relationships involve an HSP. And everyone has at least one HSP friend. I have found that when HSPs aren’t understood by themselves and others, that spells trouble. That’s surely part of why my data show that, on the average HSPs, are a bit happier paired with each other. They understand each other. My data also show that on the average HSPs’ relationships in general are less happy–implying that relationships HSPs are in are less happy, at least for the HSP. Why? HSPs have nervous systems that pick up more on subtleties in the world and reflect on them deeply. That means, for starters, that they will tend to demand more depth in their relationships in order to be satisfied; see more threatening consequences in their partners’ flaws or behaviors; reflect more and, if the signs indicate it, worry about how things are going. Because HSPs are picking up on so much, they are also more prone to overstimulation, quicker to feel stress–including the stimulation and stress that can arise in any intense, intimate interactions. They need more down time, which can cause a partner to feel left out. They find different things enjoyable compared to others. 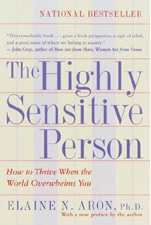 The Highly Sensitive Person in Love also explores, to a lesser degree, the other basic, well researched inherited trait-sensation seeking. Sensation seekers (SSs) are born with a deep curiosity and need to explore. Although this sounds like the opposite of being sensitive, nature planned it otherwise. Different genes and brain systems seem to govern the two traits, so that HSPs can also be SSs. But it certainly complicates their lives. An HSP with very little of this trait, in a relationship with a non-HSP/SS will certainly have a conflict-filled if exciting relationship. Self-tests at the beginning of The Highly Sensitive Person in Love allow individuals and couples to see how they rank on both traits. Even though temperament is invisible, it is very real. I have found many couples in which one person answered every question true on one of these self-tests, the other, false. That makes for a lot of misunderstanding and “what’s-the-matter- with-you?’s.” No wonder genetics cause 50% of the divorce rate– this figure represents the many divorces caused by the pairing of persons with extremely different temperaments who have no clue about how the other really experiences life. As with my first book, this one looks carefully at the effect of culture on HSPs–how it makes an HSP feel less desirable, less confident. The problems are special for male HSPs. As many men as women are born sensitive, but the stereotype is that women are sensitive, “real” men are not. Women love to be friends with male HSPs, but want to date and marry non-HSPs. One goal of The Highly Sensitive Person in Love is to help HSP women realize their mistake and HSP men to feel less to blame for their situation. Another goal is to explore the different ways that HSPs and sensation seekers approach intimacy. HSPs are naturally cautious and reflective before committing. They also have good reason to fear being rejected for being “too sensitive” or overwhelmed by another’s needs. Sensation seekers also fear commitment, for quite different reasons–the loss of variety, the fear of boredom. I provide a self-assessment of eight fears about deep love, then suggests what to do about each. After that, we discuss how to meet someone and fall in love, if that’s your desire, whether you would like to meet an HSP or a non-HSP. Most important, this book tailors all those relationship self-help books to meet an HSP’s needs. For example, it tells partners who are temperamental opposites why they fell in love and how to get along together now. It’s not simple. The initial, often extraordinary attraction dissolves fast with familiarity. Then each can feel deeply disappointed with the other, even contemptuous. Similars can get into trouble too. In fact, my husband and I have been granted large research grants to study the effect of boredom on relationships. Boredom is a special problem for a pair of similars, two HSPs in particular. They may be initially excited to find their similarities, but in time tend to use each other as a sanctuary rather than as a partner in exploring new experiences. This is only one of the problems I address in the chapter on HSP-HSP pairs. Finally, I also develop six crucial pointers for HSPs in relationships, whatever the temperament of their partner. Finally, I am very proud of the chapter on love and spirituality, even though my editors had grave misgivings. I know what HSPs like. Or I hope I do. 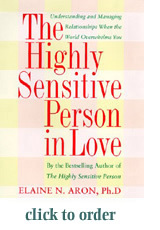 Let me know how you like The Highly Sensitive Person in Love. >> Go here to purchase. Excited to announce the next HSP film is underway! to rent or purchase Sensitive: The Untold Story. 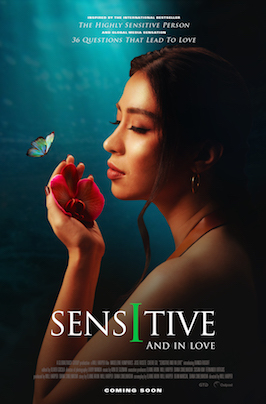 Click here to learn about the Foundation for The Study of Highly Sensitive People and how you can contribute. for updates and announcements about events, book releases, blog posts and other news of interest to the HSP community. We will not share your information with anyone else. See a typo or trouble with the website? Please let us know here. For other questions, problems, or feedback, go here and choose the email address that fits your needs. Copyright © 2019 Elaine N. Aron, Ph.D. — All rights reserved.